La Terrera Hostel i Tenerife, Spanien: Reservér nu! La Terrera Hostel, has three very comfortably equipped rooms with lockers so that you can store your things, each room with heating and a good ventilation. We also have 2 bathrooms exclusively for our guests. Room ALCOBA: 2 bunk beds. Enough space for the four with the 2 closets and the lockers each one with its key. 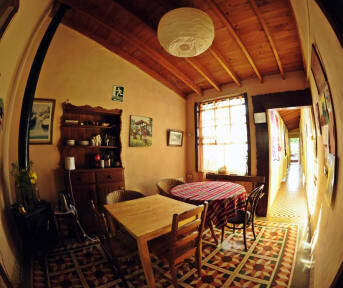 This bedroom is ,in its style, tipical in this kind of Canarian antique houses. It is a room that has a skylight where the light comes from, apart from the windows that opens to the corridor, as it is a room that overlooks the dining area and the fireplace. It is a very nice room. The DESTILADERA Room: has a double size bed. This room overlooks the hallway, and it's just few steps from the garden, our backside patio, which will give the room a very good ventilation indeed.
. Living Desk: bright and spacious living room decorated with antique furniture. Enjoy the library, wifi, music and stay connected with other people!!
. Dining/Breakfast area: cozy where everyone meets in the morning and people usually end up spending the dinner toghter!!
. small patio: In case you need a laundry service, in this small patio we have the washing mashine, the dryier and a place where to hang all the clothes.
. Big patio on the back: Big open space, ther's a garden with plenty of sun where we're growing some different vegetables, depending on the season. It is a common space, where wifi is reachable everywhere, we have an hifi sistem for some good music and we also offer a bar service. It works very well as a Solarium as well, in the summer time of course! !